“Community Days” are special events held every month on Pokémon GO. During the event period, the spawn rate of a certain Pokémon will increase, making it easier to acquire. Items and other bonuses are also given. For example, with the January event, the spawn rate for Pikachu—equipped with the rare “surf move”—significantly increased. Users were also given the ability to more easily capture monsters, as “Lure Module” (a tool that lures Pokémon) effectiveness was extended. 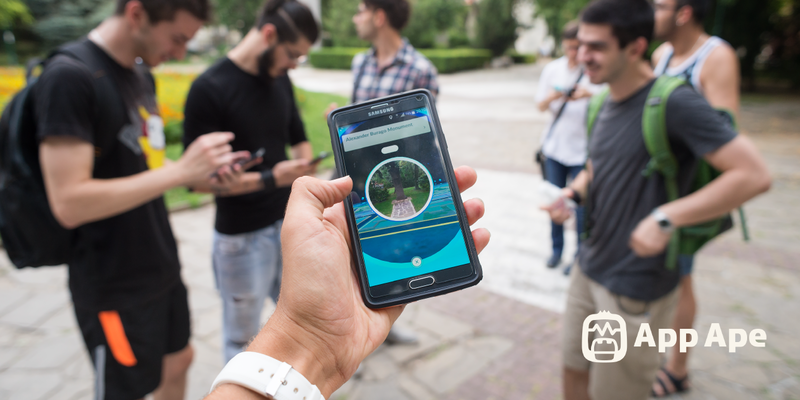 Scheduled for one day a month, Community Days are shown to swiftly increase user enthusiasm, as the competitive setting only lasts for a few hours in the day. 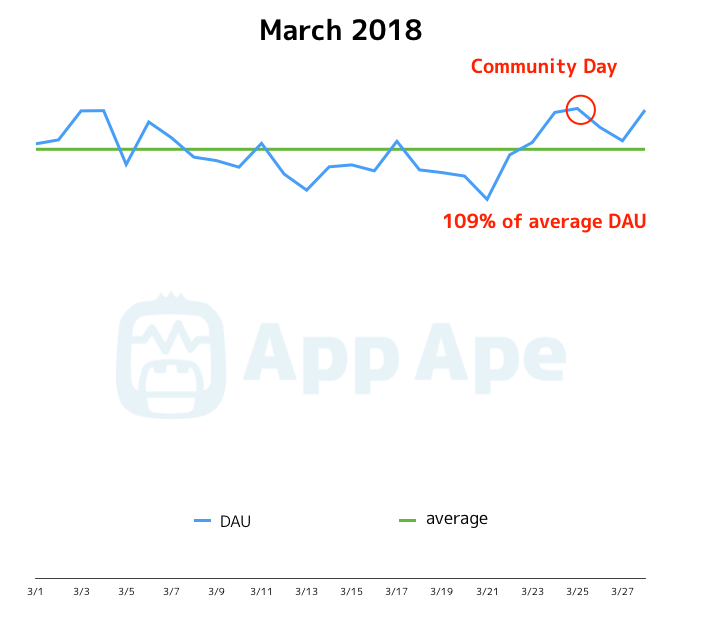 We will analyze the data of Daily Active User (DAU) and “Hourly Active Users (HAU) acquired by App Ape on Community Day, deeply examining the elements that drive game events and encourage Community Day sustainability. Community Days were launched in January 2018. 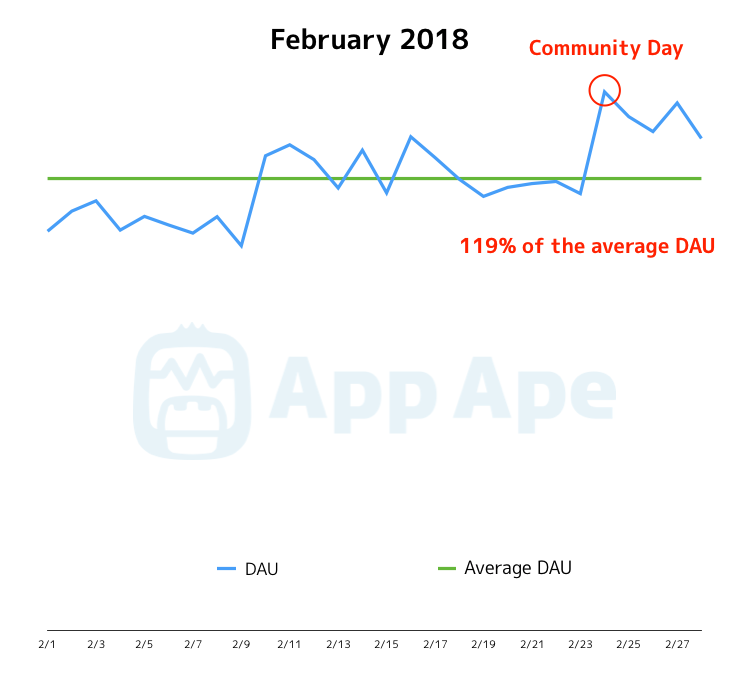 Let’s take a look at the actual success of Community Day by using App Ape to look at DAU and HAU on event days from January onwards. The first Community Day was held on January 20, from 12:00 p.m. to 3:00 p.m. The Pokémon selected for increased spawn rate was Pikachu, the brand’s flagship character. 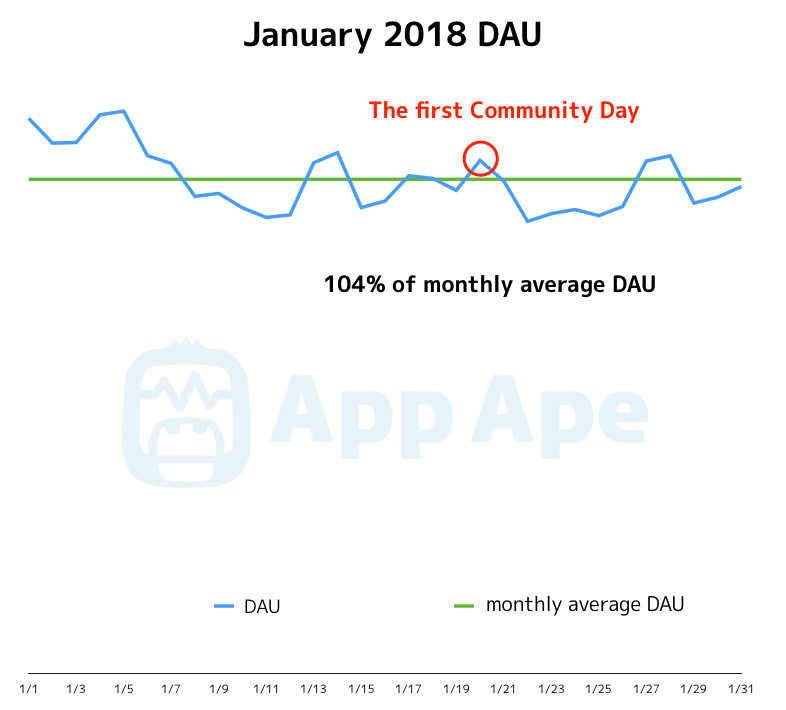 Looking at the DAU, the beginning of the year shows the larger peak, 4% greater than the average monthly amount. 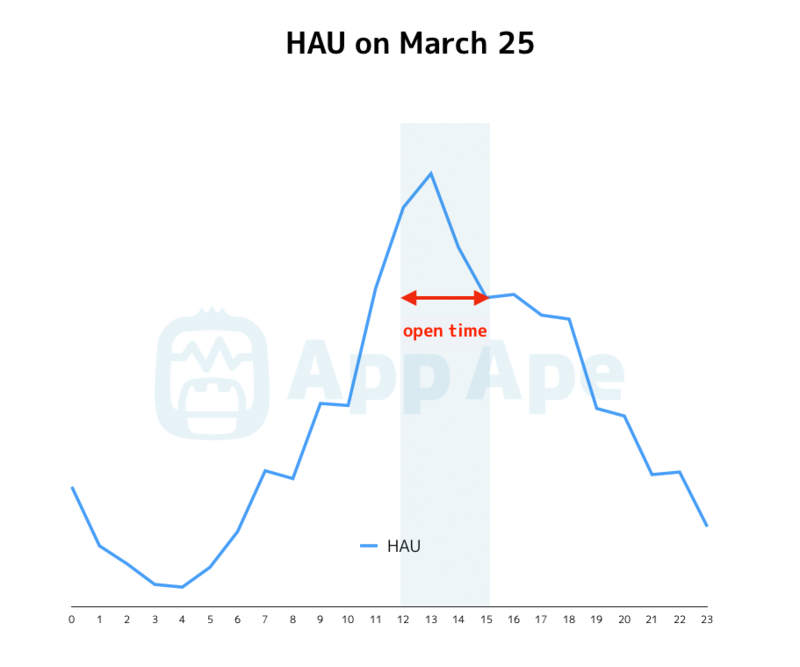 However, when examining HAU, we can see that many users aimed at the event launch time and opened the app. The main focus for the first community event was on Pikachu with the surf move. By the end of the event, many users had achieved the goal, which may explain the sudden drop in users opening the app afterwards. The second Community Day was held on February 24, from 12:00 p.m. to 3:00 p.m. This time the spawn rate increased for Dratini, a first-generation Pokémon that has been with the series from the very beginning. In addition, users could also obtain a special Draco Meteor skill if they could evolve Dratini into final form Dragonite over the course of the event period. Dragonite, the evolved form of Dratini, is considered one of the strongest classes of Pokémon. It appears that many users tried to get the non-evolved Dratini during the event period, as we can see a clear peak in DAU. On the day of the event, network trouble resulted in a three-hour extension over the end scheduled time 3:00 p.m. 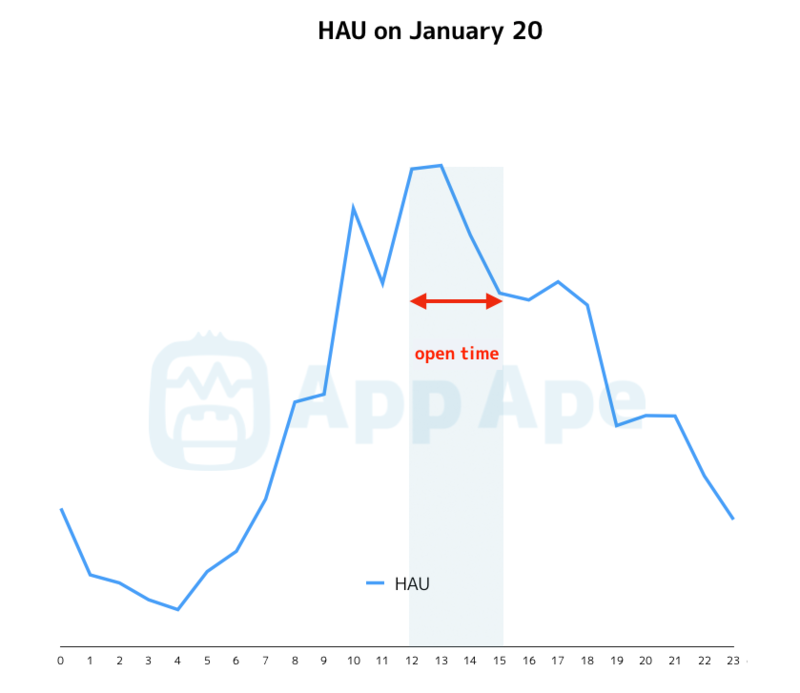 The HAU graph shows a rapid increase in users starting around 12:00 p.m., with little decrease in user numbers until 3:00 p.m. While the numbers gradually decline after 3:00 p.m., the level still remains high. This may be because users continued playing, trying to evolve Dratini within the event time. The third community event was held on March 25, from 12:00 p.m. to 3:00 p.m. This time the spawn rate increased for Bulbasaur, the veteran first-generation Pokémon. Just as with prior events, a bonus Frenzy Plant move was offered to users who evolved Bulbasaur into its evolved form Venusaur during the event period. Though Venusaur is well-known among fans, the DAU did not increase as much as it did the month prior. While it certainly peaked, it varies little from the peaks at the beginning and end of the month. 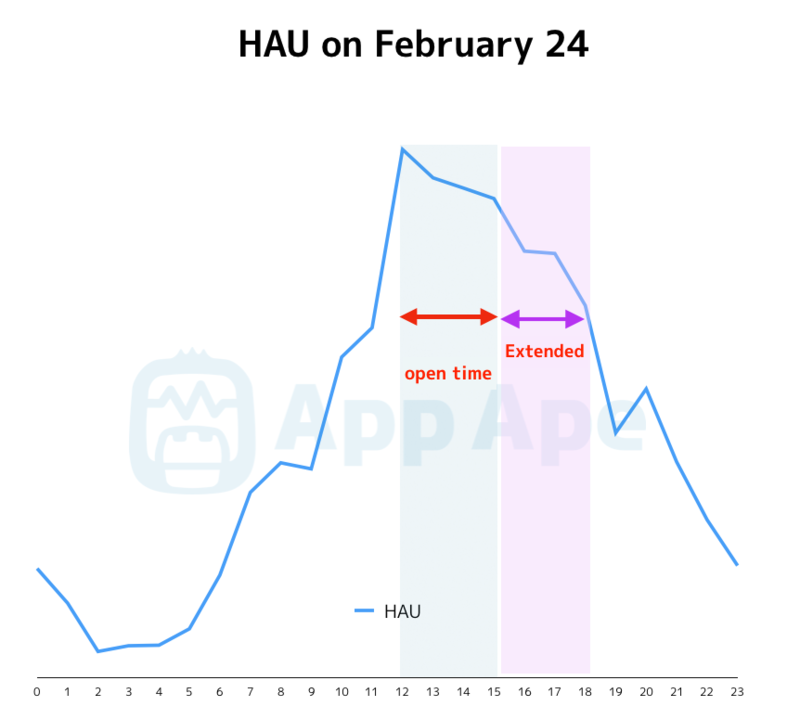 Despite offering a special move by evolving the Pokémon within the event time (just like the month prior), the HAU peak could not be maintained. There were many comments voicing disappointment and confusion about the Pokémon selection when it was first announced. Apparently, many felt that Bulbasaur was not good enough compared to Dratini or Bulbasaur was not as practical or popular as Dratini. Ultimately, the users’ opinions are reflected in the data. The fourth Community Day was held on April 15, from 12:00 p.m. to 3:00 p.m. In actuality, the event launch was delayed 10 minutes due to a bug. The delay resulted in the event being extended an extra hour. This time, the spawn rate increased for Mareep. Users could acquire the rare Dragon Breath move by evolving to Ampharos. DAU visibly peaked on the day of the event, and on the day prior. For HAU, user numbers increased once the event started, and remained stable until 3:00 p.m.
Of note, for this Community Day there were various irregularities that occurred in addition to the bug mentioned previously. To start with, Mareep is a rare Pokémon that is difficult to acquire in regular play. In addition, on April 15 it rained throughout the country, resulting in a Weather Boost that allowed users to acquire various bonuses from electric-type Pokémon, including Mareep. On top of that, the Kanto Week event was being held at the same time, providing an additional candy bonus that users could acquire by hatching Mareep’s egg. Compared to other Pokémon that had been featured in Community Days, Mareep was not particularly well-known. 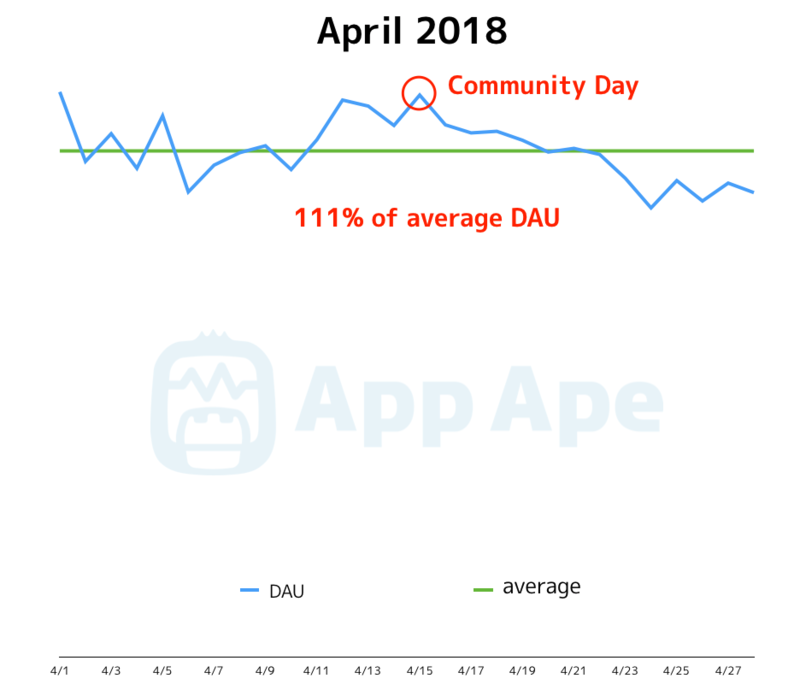 The minor peak in DAU growth represents the degree of enthusiasm among light users. On the other hand, the HAU growth can be seen to reflect the enthusiasm of heavy users fully taking advantage of the opportunity. Finally, the fifth Community Day was held on May 19, from 12:00 p.m. to 3:00 p.m. This time the spawn rate was increased for Charmander, well-known among fans. Evolving to Charizard within the event time would give users the Blast Burn move. 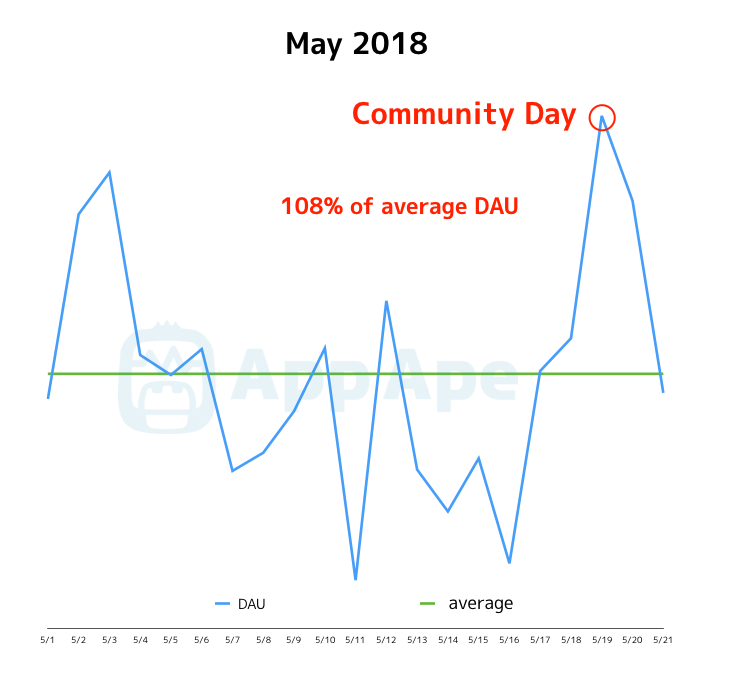 While data was only acquired up to May 21, the DAU recording for this Community Day reached a highest peak in May. 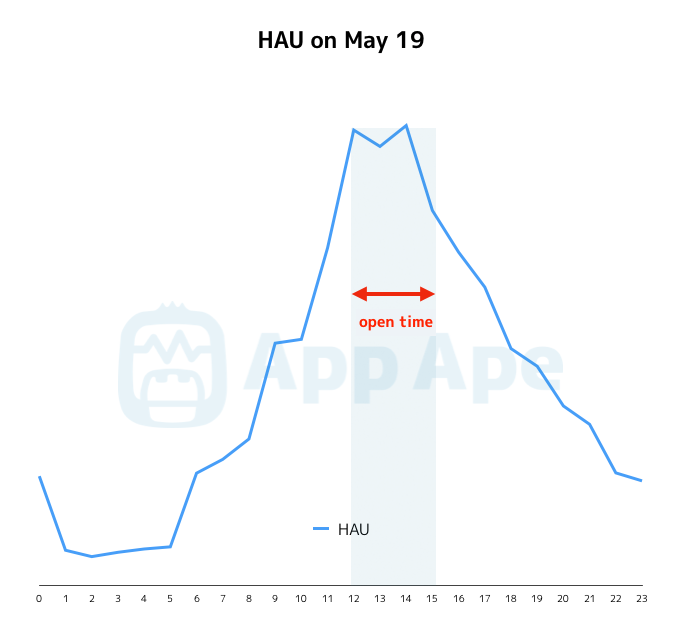 In addition, the HAU graph showed stable active users until around 2:00 p.m. After that, user numbers gradually declined and returned to a stable level. With Community Day events has been established now, we can expect to see users adjusting to the event schedule. We can conclude that this is the basic graph form for Community Day HAUs. For Community Days, first the time and date are announced, with details on the event announced later. Users are constantly talking with one another about their predictions for future Community Day events. It’s clear that the events have become popular. While DAU growth depends on the event, it nonetheless always sees an increase. 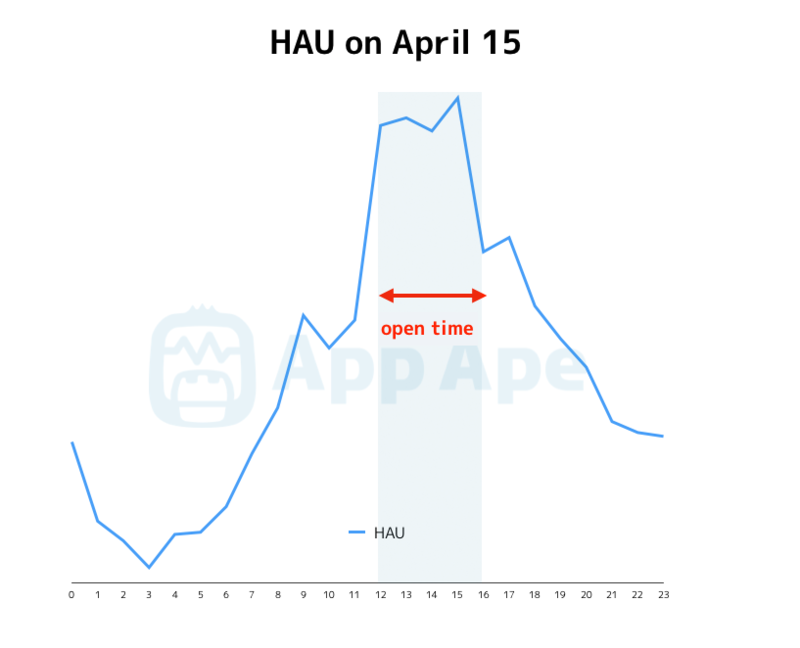 In addition, it is clear that changes in HAU reflect the actual activity of users. App Ape can acquire incredibly precise information including app data for other apps and the number of app starts separated across user segments. The data acquired from other apps may contain hints that will help with formulating events. In addition, using data to see regular users’ reactions to events being held should help create even more appealing events. Please get in touch if you’d like to see how these results can be used for event planning.